This recipe for simple glazed carrots deserves to be in your Thanksgiving recipe line up. I don’t think you can go wrong with these. Unlike my pickled carrots which people will think are too sour or my roasted rainbow carrots recipe which people may think are too weird (purple?) – these are a crowd pleaser. 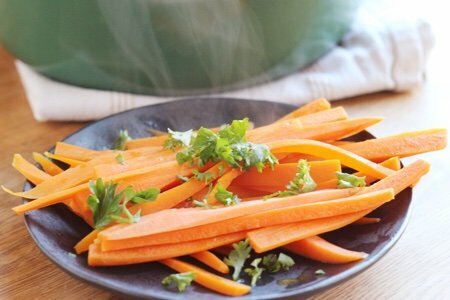 The carrots are seasoned with a little big of sugar, lemon juice, and butter. 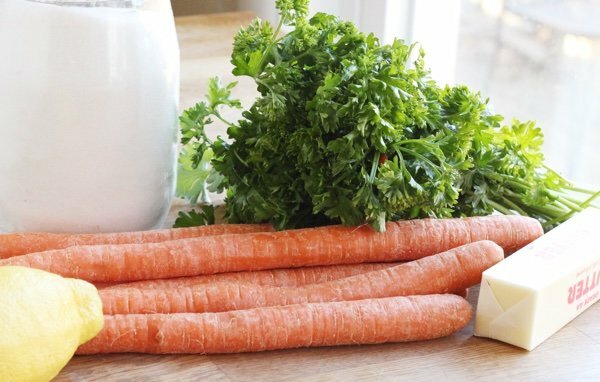 The carrot flavor is perfectly sweet and delicious with these additions. I love this recipe because you can’t wreck it if you cook it and then heat it up later. I do undercook the carrots a little so when I am ready to go they are perfect. These are also great for Thanksgiving because they are not overworked like so many of the dishes. I am talking about bourbon, pecan, marshmallow sweet potatoes or hazelnut, pancetta, oven roasted Brussels sprouts. These recipes are great but too many of them can hurt my tummy. The richness of the food can be overpowering if you have too many complicated dishes. I like these carrots precisely because they taste mostly of carrots. I could eat them all day and why shouldn’ I? At only 75 calories per serving, they will beat any other side for lowest amount of calories. For the vegans out there, feel free to use olive oil and maple syrup to make this dish. This is the most classic version but people use honey, brown sugar, and other types of oils to make it theirs. Slicing the carrots thinly enough takes a little practice. I slice mine in half lengthwise so I have a flat surface and then I slice along the side to make it easy. I hate trying to slice things that are running around my cutting board (I am looking at you, onions). 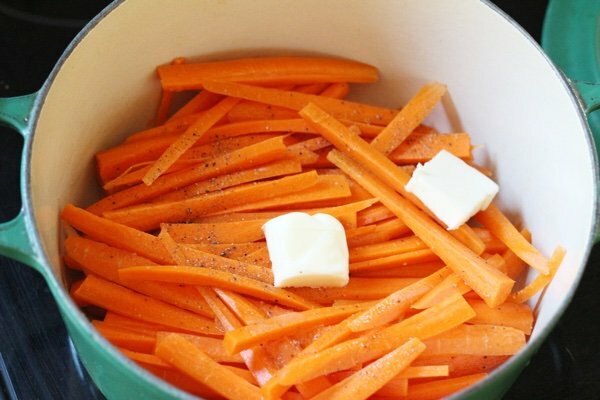 Cut the carrots into very thin slices. 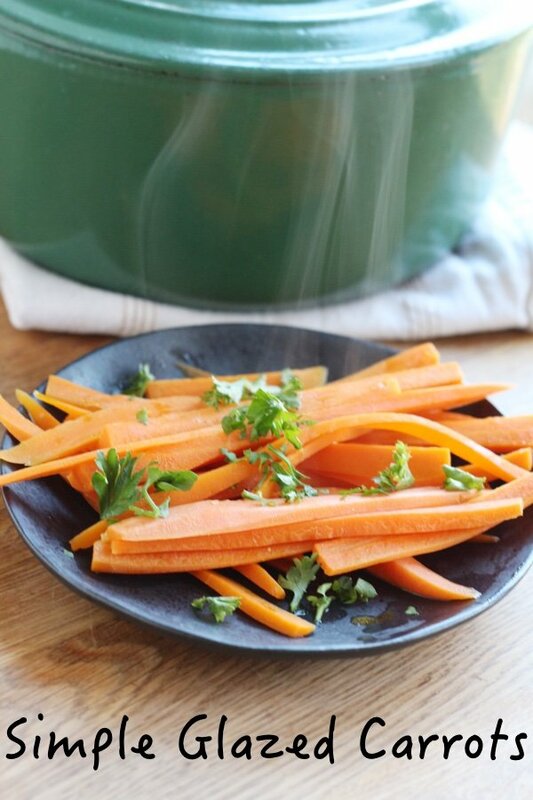 Add carrots, sugar, water, lemon juice, butter to a medium saucepan and add salt and pepper to taste. Heat to medium high with a tight lid on and cook for 9 minutes until the carrots are your favorite tenderness. Add fresh parsley and serve. You can make this the day before and heat the carrots in the microwave. Wait to add the parsley until ready to serve. Our school cafeteria cooks used to add vanilla, cinnamon, and just a bit of sugar to make even the watery canned carrots edible. Then someone in charge told them they couldn't alter the "approved" menu items, and the bland carrots ended up in the trash again.